It’s that time of year again… for many of us, holiday gift shopping is officially underway! We understand how overwhelming and expensive the gift buying process can be so we’ve tried to make it as easy as possible for you! No matter who is on your list, we are confident that we have something unique, meaningful, and affordable for all the women in your life. Take a peek at the list below to find some inspiration and simplify your shopping this year. Because if there’s one thing we’re exceptionally passionate about at In A Pikle, it’s being prepared! Miss Prepared: The yellow and blue kaleidoscope pattern is dainty and fun, but the 30+ contents inside make it exceptional. For the girl who never likes to be caught off guard, this is the perfect addition to her stocking (and purse). Contains nail clippers, bandages, tweezers, scissors, a sewing kit, lens wipes, bobby pins, rubber bands, safety pins, paper clips, screwdrivers, hair bands, and soap sheets. Miss Germaphobe: Do you know someone who spends the winter months avoiding germs at all costs? This handy little bag comes with all the essentials she needs to make it through cold and flu season with confidence. Contains hand sanitizer, antibacterial wipes, bandaids, pill box, and travel tissues. This is paired with our Gold Relish Pikle which is upscale enough for an accessory for all your holiday parties. The Dance Mom: For the mom who spends her days driving to and from practice and watching recitals on the weekends, this pretty bag comes with the right items she needs to keep her little dancer (and herself) looking and feeling great. Contains cotton swabs, earring backs, refillable nail polish bottles, oil control sheets, nail polish remover pads and the floss and mirror combo. The Dancer: For the dancer herself, this pretty blue emergency kit is a must-have addition to her dance bag. It’s unique and eye-catching, but mostly it’s the best way to stay prepared. Contains mirror and floss combo, tweezers, nail clippers, emery boards, hair bands, bobby pins, mini pen, and a sticky notepad. The Babysitter: Whether she’s a teenager or full-time nanny, this bright and fun bag is the perfect kit to keep on hand for life’s little emergencies. It comes with all the essential items she needs when spending her days with energetic and unpredictable kiddos. Contains nail clippers, bandages, tweezers, scissors, a sewing kit, lens wipes, bobby pins, rubber bands, safety pins, paper clips, screwdrivers, hair bands, and soap sheets. Plus with it comes with permanent markers to decorate the Petite making their own unique style. Miss World Traveler: For the boho babe on your list that can’t get enough time abroad, give her the perfect travelling companion. This cute bag comes packed with the perfect necessities for airplane travel, road trips, hiking, and more. Contains toilet seat covers, lens wipes, bandaids, pill box, travel tissues, and soap sheets. The Teacher: This is currently one of our favorite gift ideas! While most teachers are being showered in gift cards, you can give a gift that’s unique and genuinely helpful. This compact and cute Petite Pikle comes packed with an incredible assortment of supplies she will love and use. Contains markers, bandages, scissors, a stapler, staples, hole punch, tape dispenser, rubber bands, paper clips, safety pins, bobby pins, hair bands, screwdrivers, and mini towel tablet. The Coach: Give your favorite coach a handy little gift that is stocked with more than 30+ convenience items. Whether she’s simply running errands or spending a busy day on the field or at the gym, she will feel prepared for anything. Contains nail clippers, bandages, tweezers, scissors, a sewing kit, lens wipes, bobby pins, rubber bands, safety pins, paper clips, screwdrivers, hair bands, and soap sheets. Miss Organized: We all know that girl who loves her label maker and somehow keeps everything organized and in its proper place. This adorable Petite Pikle, along with its 30+ convenience items, will help take her organizational skills to the next level. Contains nail clippers, bandages, tweezers, scissors, a sewing kit, lens wipes, bobby pins, rubber bands, safety pins, paper clips, screwdrivers, hair bands, and soap sheets. The Soccer Mom: It’s hard work to keep track of our kids’ schedules and get everyone to all the games and practices on time. Give your favorite soccer mom the gift of organization with this cute Petite Pikle bag packed with our best outdoor items that are sure to lighten her load a bit. Contains carabiner, bandages, pocket knife, matches, tool card, lens cloth, clippers, tweezers. The Super Mom: Moms are amazing. And for the mom who is currently caring for a young child, help her feel a little more prepared and cute at the same time with this cute organizer bag and handy items designed just for her and baby. Contains a goober getter, clippers, thermometer strips, cotton swabs, soap sheets, and mini towel tablets. The Fashionista: This new denim pattern is one of our current favorite items for winter. The fashionista on your list will also love its look. Next, pack it with all the items she needs to feel beautiful while she’s on the go… and you’ve got a gift that’s a homerun. Contains cotton swabs, earring backs, refillable nail polish bottles, oil control sheets, nail polish remover pads and the floss and mirror combo. The Millennial: Finding the perfect gift for anyone is hard, and finding a trending gift for Millennial’s is extra hard. This clever gift can please any generation but is designed for the Millennial. Contains nail clippers, bandages, tweezers, scissors, a sewing kit, lens wipes, bobby pins, rubber bands, safety pins, paper clips, screwdrivers, hair bands ans soap sheets. I hope this list helps you find the perfect gift for that special woman on your list. 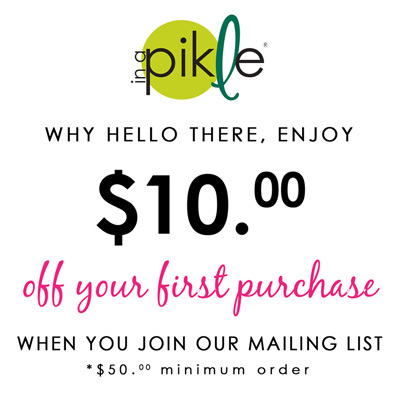 If not, we have so many more products to choose from at In A Pikle. This entry was posted in In A Pikle and tagged babysitter, buy, Christmas, coach, dance, dancer, germaphobe, gift guide for her, holiday, last minute gifts, millennial, millennial's, mom, mother-in-law, organized, overwhelming, prepared, present, shopping, simplify, teacher, travel, world traveler.